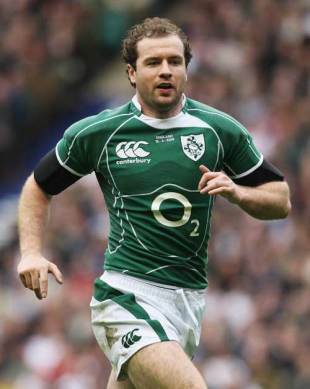 Geordan Murphy is braced for an aerial bombardment when Ireland collide with Argentina. The high ball was a key weapon in the Pumas' march to third place at the World Cup last autumn and Murphy expects Juan Martin Hernandez to unleash another barrage at Croke Park tomorrow. Marcelo Loffreda became Leicester's coach after masterminding Argentina's success in France, giving Murphy an invaluable insight into the South Americans' tactics. "They love a high ball. I think the Argentinians do it very, very well, having played against them a few times before," said the Tigers full-back. "I was coached by an Argentinian last season and it was certainly one of the principles that he worked very hard on and that I worked very hard on underneath him. "I'm sure it will be raining from a great height and hopefully it will go well for us at the weekend." Murphy's positioning will be tested to the full upon his recall to the team should Hernandez produce the expected barrage. It is the fifth time he has faced Argentina and the 30-year-old, who will be winning his 59th cap after replacing Girvan Dempsey, has huge respect for one of the powerhouses of Test rugby. "Argentina are a very proud nation, it's always a very physical game against them," he said. "Now they've got some skilful backs, and very quick and elusive backs. They're a complete side. They're ranked fourth in the world and they haven't got there by accident. "They're a strong team and it's going to be a very difficult game for us at the weekend." Murphy is one of three changes to the side thumped 22-3 by New Zealand, with Jerry Flannery replacing Rory Best and Stephen Ferris coming in for Alan Quinlan. Ferris returns after producing a man-of-the-match display in the autumn opener against Canada and the Ulster back row is eager to face the Pumas. "I really relish the physicality and it's something I'm really looking forward to tomorrow," he said. "Argentina bring many different players that offer many different things but one thing for sure they'll bring is a physical game. I think the back row we've got will be itching to get into them."